· Best value: Almost every device on the planet is supported. Includes are profiles for AppleTV, iPod, iPhone, PocketPC, Smartphone, XBOX, Zune etc. No need to purchase the same program for different devices. · Can create files using DIVX, XVID, WMV, H264, AVC, MPEG4, 3GP and more. Can convert more obscure video file formats (Real, SWF, MKV, OGM etc) even if your computer can not play them. · Newbie-friendly: DVD Catalyst 3 is designed to be as easy to use as possible for the beginner, yet provides enough features for the guru. · Monitor folders: DVD Catalyst 3 can keep track of your Media Center or TiVo recordings, and convert them automatically whenever new files are found. · Easy to use: DVDs in your computer are automatically detected as well as when you put them in. All you need to do is select the video player you have and press GO. · Future proof: Support for new devices, as well as improvements for the older ones are continuously worked added. · Multi-device conversion: Only DVD Catalyst 3 allows you to queue multiple devices for conversion, creating the same movie optimized for all selected devices. · Batch conversion: DVD Catalyst 3 allows you to queue conversions of as many DVD drives as your computer can handle (both real and virtual) and as many video files (ISO files supported) as you desire to as many devices as you desire. Once the conversion is done it can shut down your computer as well. · Language and subtitle support for both DVD and video files (MKV and SRT) With DVD Catalyst 3, you can even set default choices for these to make conversion even easier. · Fully automatic conversion capability. DVD Catalyst 3 can start when windows starts, check for new files in folders and automatically convert them by using your preferred settings. · Actual (80 page) user guide included in the installer. While not needed for general use, it offers complete assistance on everything DVD Catalyst 3 has to offer and more. · Fully featured 7-day trial version. You get to use DVD Catalyst 3 for 7 days without any additional limitations. No watermarks in the video files you create, and most definitely no 5 minute video clips of a 2 hour movie. 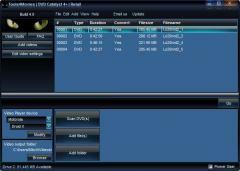 · New in DVD Catalyst 3.80 is support for an updated encoding engine. This is provided as a separate download because some of the less-common video formats available in DVD Catalyst might not be compatible. IAM looking at it ?